Rayyane Tabet’s project Sósia (2016) for the 32nd Bienal originated in the fiction created by the artist about the Lebanese diaspora in Brazil and the narrative surrounding it, culminating in the hope for eventual return and rescue. The work consists in the commissioning of a translation from Portuguese to Arabic of the novel "Um copo de cólera" [A Cup of Rage] (written in 1970 and published in 1978) by Brazilian author Raduan Nassar, the son of Lebanese immigrants, and its publication in Beirut. The novel was translated by Mamede Jarouche, the man responsible for the first full Portuguese edition of One Thousand and One Nights, and it will be released by Lebanese publisher Al-Kamel Verlag. Tabet’s work can be viewed as a circular collaboration between the artist, the author, the translator, and the publishing house; an encounter between narratives and people. The artist himself takes the role of provocateur, pushing forward an idea that has the potential to change the cultural understanding of two related but distinct societies. 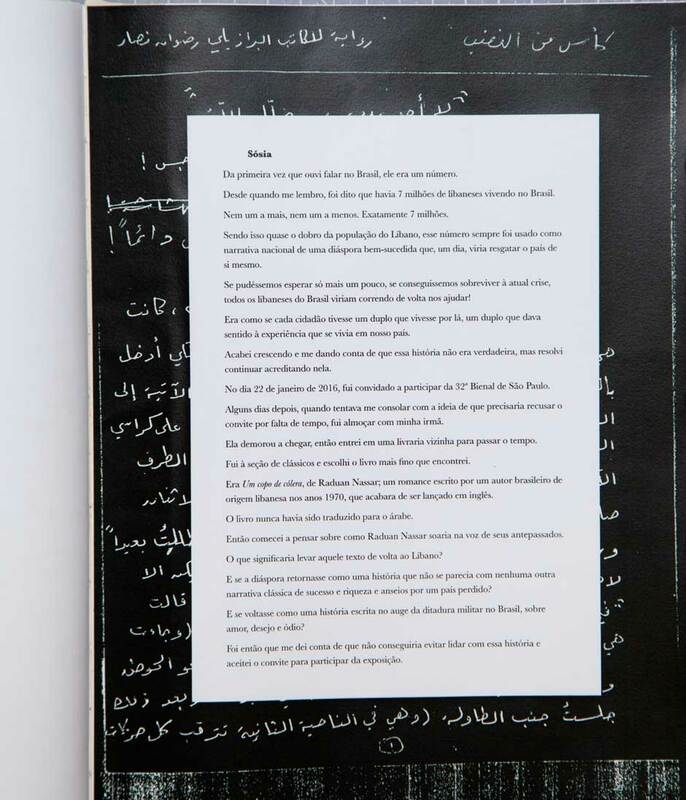 A recording of the artist reading the book’s famous chapter ‘The Explosion’ in Arabic can be heard at several locations throughout the exhibition. Nasser wrote the novel at the height of Brazil’s military dictatorship, addressing themes of love, lust and anger.